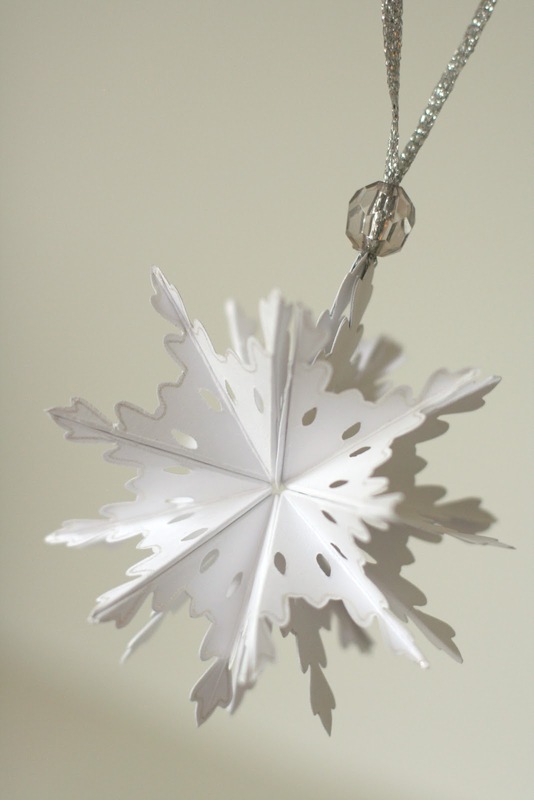 I've got a really fun 3D Christmas ornament to show you! It's very inexpensive to make (paper, ribbon and a bead) and is so interactive for the recipient. Plus it stores easily since it folds up, so you can use it for years and years! 1. Cut 5 snowflakes (or circles, or squares, whatever you want). 3. Fold along first two score lines (the ones at 90 degrees). Turn the die over and fold in the opposite direction along the score in between the first two lines. 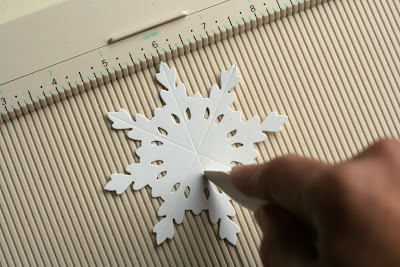 and push down so you have a 1/4 section of the snowflake. Repeat for the remaining 4 die cuts. 5. 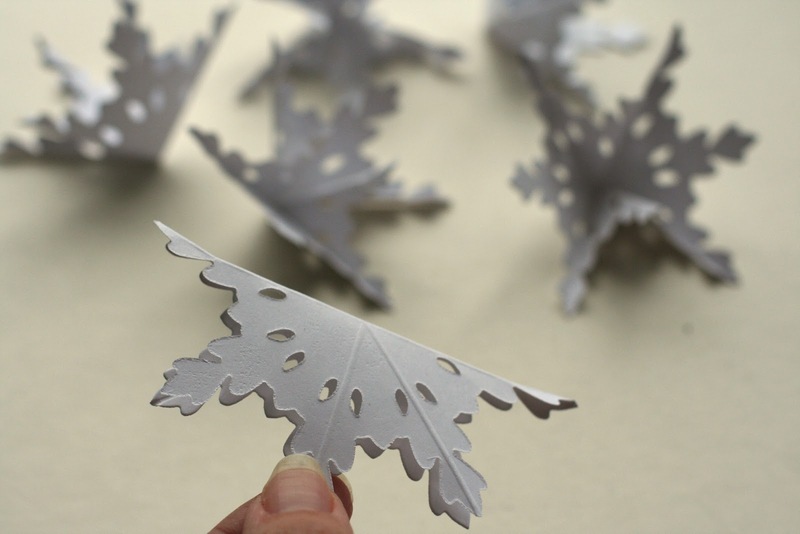 Glue each folded die cut on top of each other. 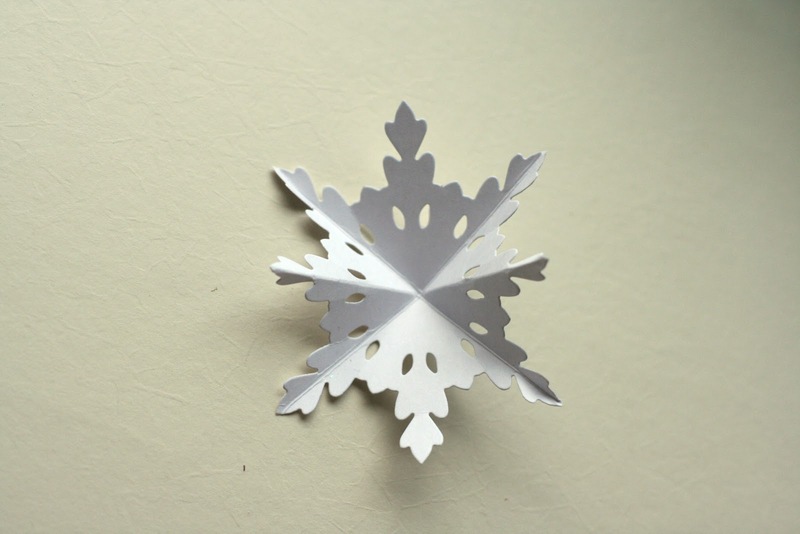 You should have a stack of 5 folded die cuts. 6. 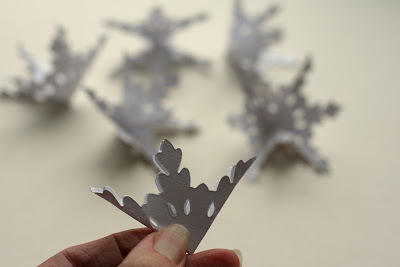 Glue a ribbon on the top of the stack of folded die cuts, with the long end going away from the pointy center. Glue another ribbon on the bottom of the stack of die cuts. Cut (2) 1/4 sections from a new die cut. Tips on the ribbon: The ribbon should be pretty long so you can tie the ends in a loop later, and allow the ornament to open up (about 6"). The ribbon should also be proportional to the size opening of the bead you will use. 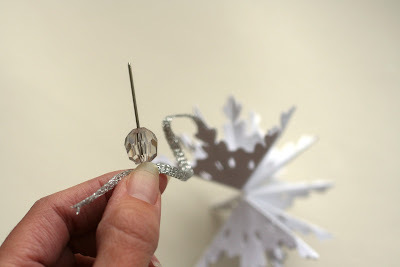 If the ribbon is too thin, your bead will flop around and won't be able to hold the ornament closed. Obviously, if the ribbon is too thick it won't fit through the bead. You can play around to make it work. For example, I wanted to use baker's twine for the circle ornaments I made for our Christmas party, but it was too thin. So I simply used two layers of baker's twine and that did the trick. It also looked a little more interesting and substantial. 7. Glue the 1/4 section on top of each ribbon so the ends are hidden. 8. Thread the ribbon through a bead. Repeat for the second ribbon. 9. Tie a knot at the end of the ribbon. Slide the bead down to keep the folded die cuts held together. 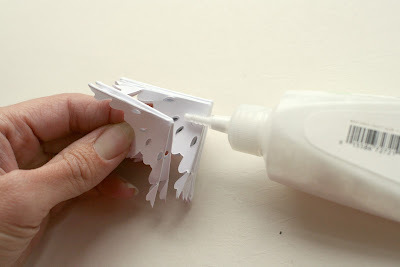 This is also how you'd store the ornament, so no worries about the tips getting bent in the ornament box. 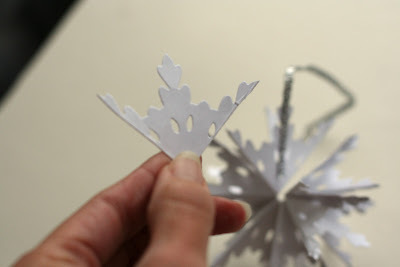 This is also how you can present the ornament, making the recipient guess how to open it. 10. 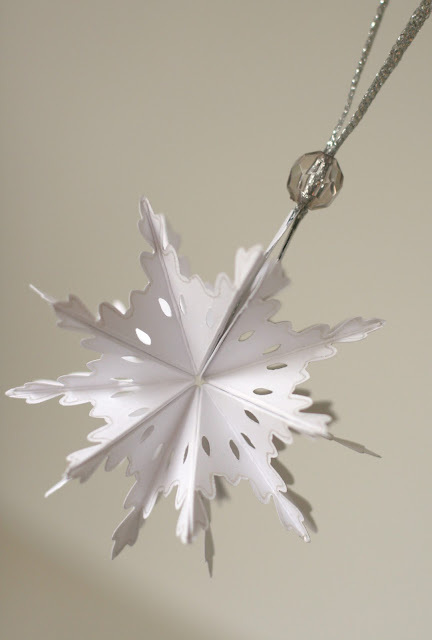 Have the recipient slide the bead up the thread and give the ornament a little flip to see it explode out into the 3D snowflake shape. Fold the dies up and slide the bead down to "lock" the ornament back into place. Here's a side view. It's a little tricky to describe and photograph, but it's oh so fun to do! If you liked this project, check out a similar one using circles instead of snowflakes. 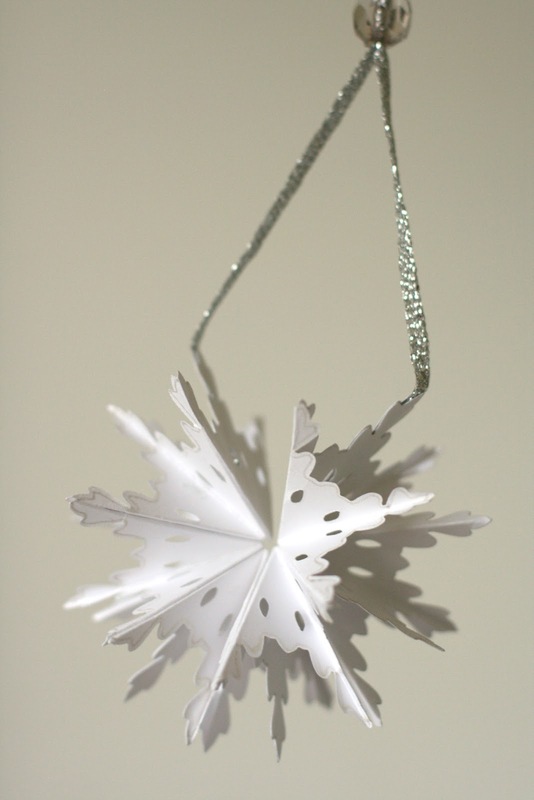 I made these as ornament gifts for all of our young cousins. They loved them! This is awesome Kelly and the little bead is perfect for this! Kelly this is so COOL!!! 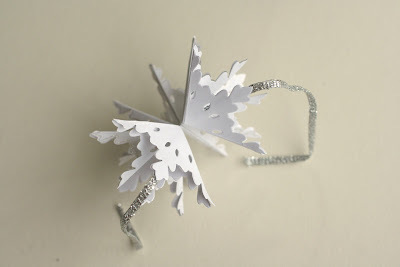 You are the queen of cool snowflake techniques my dear!!! Hey Kelly! 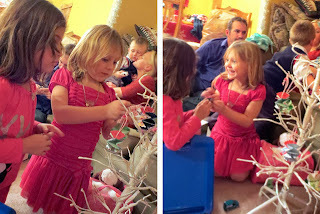 Thank you so much for taking the time to prepare this picture tutorial and sharing it with us! Your time is truly appreciated...especially at this busy time of year. That is super cool. I would love to give it a try! 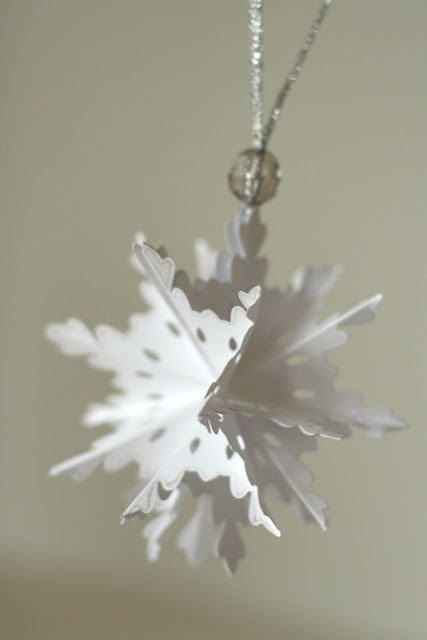 Love this ornament! Thanks for the tutorial! How cool is this? Thanks for a great tutorial, too! This is pretty darn cool! I am pinning it....hoping to find some time to try it! This is a terrific project Kelly~I love this! I'll have to pass this tutorial on to my crafty friends. What a gorgeous ornament. And how fun that you can fold it up!! Ok now I am going to try this. Like I said before you are amazing! Thanks for taking the time to show us the steps … I hate doing that. I love it Kelly. What did you use to make your Snowflake? Hi there! 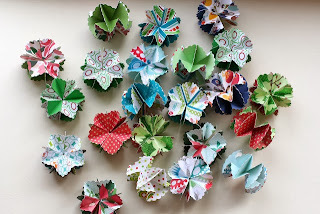 Are there instructions for making the round paper ornaments (or a video). Thanks! Hi Cheri! I don't have separate instructions for the circles, only because they are made exactly the same way as the snowflakes. You can just score/fold your circle in half, turn 90 degrees to fold again, and then fold in between those two folds (at 45 degrees). Exactly the same way. Good luck!